The board of trustees of Johnson County Community College reviews and authorizes the naming of campus space based on financial gifts and/or distinguished service to the college. The Nerman Museum is honored to recognize the following individuals and foundations for their support of the visual arts at JCCC. The James Biffar Foyer is located at the cantilever entrance to the Nerman Museum of Contemporary Art. Jim Biffar was a major collector of American Indian art and a longtime volunteer in the JCCC Gallery of Art. His efforts during Beyond Bounds fundraisers were instrumental to the success of the events. Founding museum Executive Director Bruce Hartman pledged the naming-opportunity funds for this space. The Barton P. Cohen and Mary D. Cohen Gallery on the second floor of the Nerman Museum is a gift to the college from Barton P. Cohen and Dr. Mary Davidson Cohen. The Cohen Gallery features work by area and regional artists, a longtime passion of both Barton and Mary Cohen. Richard and Jeanne Galamba pledged to the Nerman Museum's endowment, which will generate revenue in support of museum programming in perpetuity. Richard Galamba was chairman and founder of Galamba Metals Group, a prominent scrap company in the region. The auditorium in the Nerman Museum of Contemporary Art is named for M.R. and Evelyn Hudson, in recognition of a gift from the M.R. and Evelyn Hudson Foundation, Dallas. Murdock R. Hudson and his family were the founders of Hudson Oil in 1932, in Kansas City, Kansas. The Ewing Marion Kauffman Foundation Gallery, the largest of the permanent collection galleries on the second floor of the Nerman Museum of Contemporary Art, recognizes the Kauffman Foundation’s contribution. Based in Kansas City, Missouri, the Kauffman Foundation is one of the largest in the United States, focusing its grants and operations on entrepreneurship and improving the education of children and youth. The conference room in the Nerman Museum of Contemporary Art is named in honor of Margery Lichtor, a longtime supporter of the college, the JCCC Foundation and the college’s Gallery of Art. Dedicated to showcasing the museum's permanent collection, the Lieberman Gallery is supported by Marti and Tony Oppenheimer. The gallery was named in honor of George and Floriene Lieberman, Marti Oppenheimer's parents. 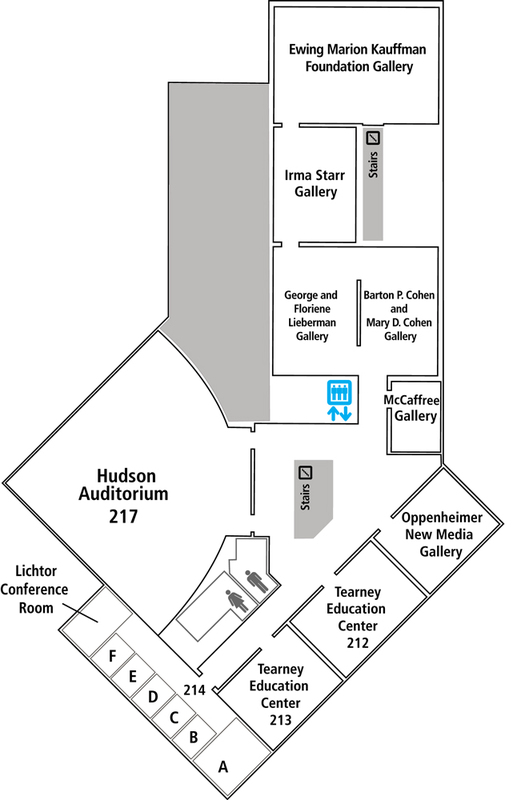 The Lieberman Gallery is located adjacent to the Irma Starr Gallery and the Barton P. Cohen and Mary D. Cohen Gallery on the second floor of the museum. An intimate gallery on the second floor in the Nerman Museum of Contemporary Art is named the McCaffree Gallery. The McCaffree family supports the scholarship program "Shooting Stars" through the Arts Council of Johnson County. The museum is named for the Nerman Family, in recognition of their lead gift in 2003 to assist with construction of the museum. The Nermans have a long history of supporting the arts in Kansas City. Jerome Nerman is the co-founder of Arrow Truck Sales, and he served on the collection committee of the Nelson-Atkins Museum of Art in Kansas City, Missouri. Margaret Nerman was a member of the board of trustees of the Kansas City Art Institute. Lewis Nerman served on the board of the Museum of Contemporary Art in North Miami, Florida, while his wife, Sue, serves as trustee of the Kansas City Art Institute. 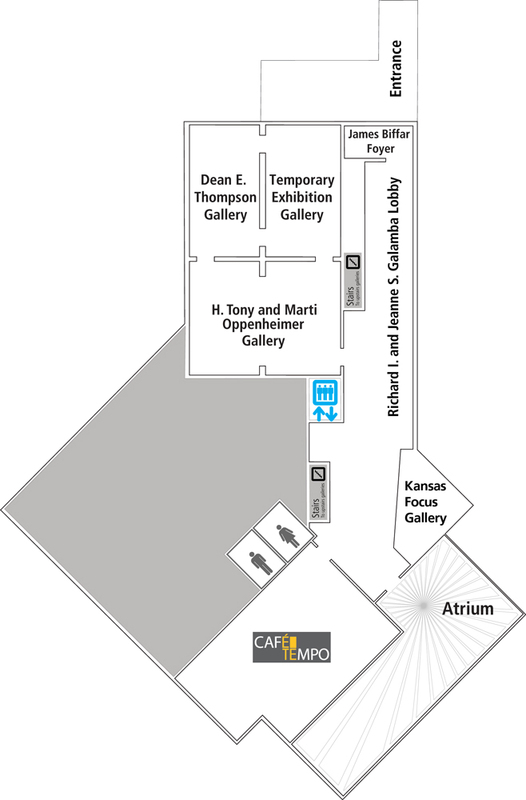 The largest of three designated temporary exhibition galleries on the first floor is named for H. Tony and Marti Oppenheimer, Kansas City and Los Angeles philanthropists and founders of the Oppenheimer Collection. The 2,500-square-foot gallery is used for major, changing exhibitions. Marti Oppenheimer is president of Marti Designs, a jewelry design firm, and Tony Oppenheimer was in banking and investment management. Both Marti and Tony serve on the collection committee of the National Gallery of Art in Washington, D.C. The media gallery in the Nerman Museum of Contemporary Art is named for Tony and Marti Oppenheimer. The Oppenheimer Collection, composed of works by regionally, nationally and internationally recognized contemporary artists, forms the Nerman Museum’s core permanent collection. The collection is funded by the H. Tony and Marti Oppenheimer Foundation. Nationally known ceramic artist Irma Starr pledged the museum an estate gift. One of the permanent collection galleries on the second floor of the Nerman Museum of Contemporary Art is named for her. Starr specializes in English slipware pottery in the traditional 17th-century style. The Tearney Education Center is a gift to the college from Jim and Mary Tearney. The center encompasses two classrooms on the second floor of the Nerman Museum. One room is reserved for arts activities for children K-12, the other for education for adults and for museum-related meetings. Dean Thompson retired from the Amoco Corporation after serving for 32 years, 1956 to 1988. From 1965 on, he served in the International Operations department, having established and supervised an audit center responsible for England, Ireland, Scandinavia, Europe, Africa and the Middle East. Thompson became interested in art through many visits to the Walker Art Center in Minneapolis, where he had a brief assignment in 1965. As of 2014, he has donated 26 works of art to JCCC and to the JCCC Foundation. For more information about named spaces, please contact the JCCC Foundation at 913-469-3835.